What did the GamesRadar team buy on Black Friday and Cyber Monday? 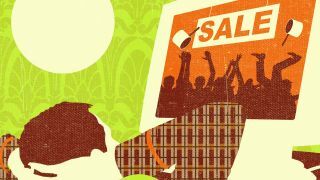 Black Friday can feel like a snowstorm of discounts, but what deals actually tempted the GR+ team to part with their cash? "Shopping for the family is always better with drinks"
"The 4K TV I wanted was exactly the same price when its 'Cyber Monday deal' ended"
I'd planned to buy a 4K TV. I did so much research into LEDs, QLEDs and OLEDs that *adopts Troy McClure voice* you may remember me from such informational buying guides as Black Monday 4K TV Deals, Cyber Monday 4K TV Deals and Best 4K TV deals in the US this Black Friday. Problem is, that my wife - who I must stress is quite reasonable - threatened to leave me if I bought too large a TV. So, I devised a foolproof plan to sneak six inches onto our existing 43 inch 1080p TV, and unbox our new 4K TV before expressing surprise that it was "seriously larger than when I checked with the tape measure". This created my second problem: no TV manufacturer makes a 49 inch OLED (the best TV panel), so I was essentially looking at a choice of three high-end (ish) LCDs or QLEDS, that never really dropped in price. "After last year’s excesses of a 4K TV and a PS4 Pro I kind of ticked off all my ‘more money than sense’ list for the near future"
"The devil on my shoulder was whispering something about a PlayStation VR bundle"
"I'm a shopping addict with an itchy trigger finger"
"I whispered into the void, and Alexa called back"
"This year nothing really caught my eye, and being from the UK the deals are nowhere near as good as my friends over the pond"
"A £49 virtual donut factory (but also a new PC)"
"It'll be like seeing reality for the first time"
"I didn't want anything, but ended up with a new phone and some exploding kittens"
Items bought: Samsung Galaxy S9, Exploding Kittens. "I don’t feel like Black Friday is for me - so I just use it to buy early Christmas presents for everyone else!" Items bought: Some secret Christmas presents.